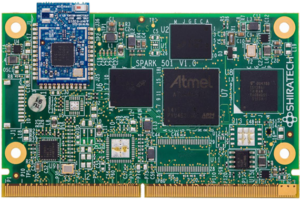 The Spark-501 is a standard SMARC System-On-Module (SoM) based on Atmel’s SAMA5D3 CortexTM -A5 system on chip. It offers enhanced power consumption by using a LP-DDR2 memory reducing the power consumption for both normal and standby operation modes. For storage the module offers both NAND flash and/or large eMMC storage. The module offer one or two Ethernet ports with built in Phy. For IOT applications which requires wireless connectivity the module offers a build in Wi-Fi/BLE module. Internal NAND flash memory offering 256MB to 1GB. eMMC 4GB or 8GB eMMC for file system and user data. Each version is provided for both NAND and SD/eMMC options. The SparkGate-7 is an open IoT gateway that provides device-to-cloud control and communications. The gateway is a complete software and hardware solution that is ready to integrate in your product. The SparkGate-7 is completely modular. You can customize the board, chose the optimal SMARC SOM for your IoT application and add your own expansion modules. 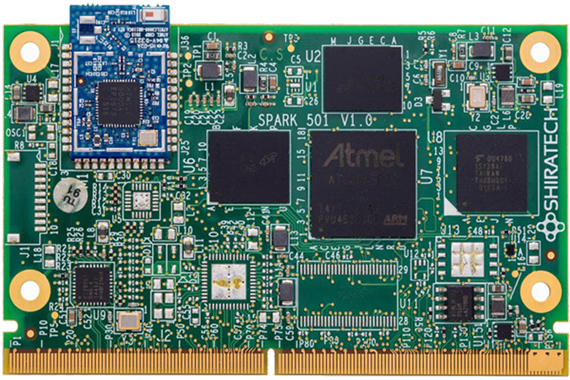 You can even use the SOM and software in your own carrier board.